As you may have read this morning, Marriott has released its new program award charts. We now also have the new chart for Marriott Travel Packages (found here). There is definitely some devaluation here, though the packages are simpler, which represents a smaller devaluation for some airlines. Most people would be much better off redeeming for a Travel Package today, though the hits to travel packages probably don’t destroy their value in the future. Don’t misunderstand that: this is a devaluation. However, if you intend to use your full 7-night certificate (and if it works at peak value), it’s not all doom and gloom either. 7 nights + 50,000 miles or 7 nights + 100,000 miles. The exception will continue to be United — packages transferring to United will receive 10% more miles (i.e. 55K / 110K). Oddly, the chart says you’ll receive up to 12K bonus United miles, but I think that’s just an error left in the chart from the current packages. 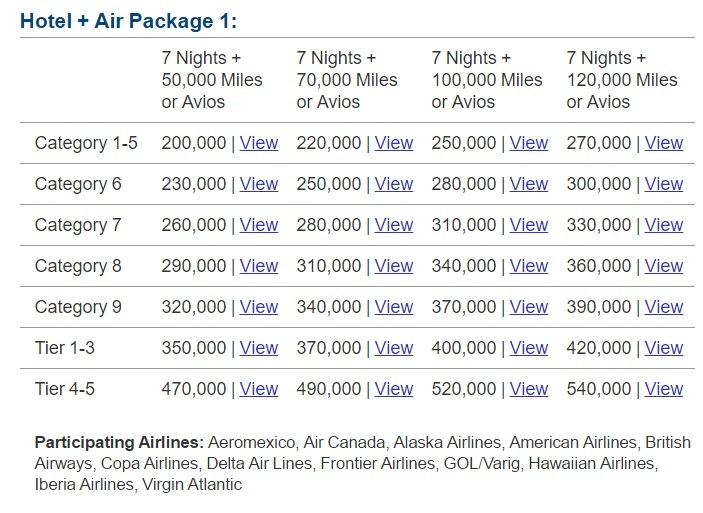 Speaking of the current Marriott Travel Packages, you’ll remember that there are several different charts depending on which airline partner you intend to package for miles. For example, a number of airlines award up to 120,000 airline miles under the current packages. As a reminder, if you are interested in booking one of the packages at current rates, you’ll want to see this post that Greg did the other day to save yourself a lot of time and hassle: Navigating Marriott’s phone prompts to book a Travel Package. I followed Greg’s instructions to a T the other day and was off the phone with my package in 20 minutes and 43 seconds. YMMV. As you can see above, the new chart obviously presents a devaluation of the packages. New Category 4 is roughly equal to old Category 5 (hotels normally cost 25K points per night either way). A 7-night stay at new Category 4/Old 5 would normally cost 150,000 Marriott points (25K x 6 since the 5th night is free on award stays). This means that the new Cat 1-4 travel package, for example, is charging an effective 180K Marriott points for 100K airline miles. That remains a slight deal in the sense that Rewards points in the new program (beginning in August) will normally transfer to airlines at a rate of 60K Rewards points to 25K airline miles. That preserves the current SPG ratio of 20K:25K. In other words, 180K Marriott points would be worth 75K airline miles if transferred directly to an airline outside the scope of a travel package. Will the 7-night certs be valid at “peak” pricing? The chart mentions a 7-night certificate at each of the 8 categories of the new Marriott award chart, but it makes no mention as to whether the certificates are valid at “peak” pricing or only “standard” pricing. That certainly makes a difference in the math. For example, Category 6 hotels have a “standard” price of 50K per night in the new program. That would mean a 7-night stay at standard pricing would be 300K Marriott points. In order to get 100K airline miles, you’ll need to pay an additional 210,000 Marriott Rewards points. At that point, the deal starts to really thin. However, Category 6 peak pricing is 60K points-per-night, making a 7-night stay during peak dates ring in at 360K Rewards points. A new travel package wouldn’t look so bad at that redemption ratio. Of course, that relies on both finding 7 nights of availability in peak season and being able to use your certificate during peak season. I do think these will work at peak pricing. My rationale for that is the difference in cost between a Category 5 package (390K) and a category 6 package (510K): 120K points. That’s the difference in cost for a 7-night stay at peak pricing (the difference at off-peak or standard would be less). I’ve recently become enamored with ANA, both for my recent excellent experience flying with them and their super reasonable star alliance award chart. While ANA partners with Marriott for travel packages, it previously fell under a chart awarding only 85K airline miles. The net cost is 60K more Marriott points for 15K more ANA miles. That’s not a good deal since 60K Marriott points would normally transfer to 25K ANA miles. If you’re after ANA miles, you are better off redeeming for a 7-night package today and then transferring SPG points now or Marriott points later for an additional 25K miles (coming out 10K ANA miles ahead). As Greg is crunching the numbers on the full award chart, it’s worth noting that the math isn’t really as simple as I made it above. I know if Greg were writing this post, he would compare Marriott points to miles differently: he would only value the 7-night certificate in terms of its trade-in value if you were to tell Marriott you’d like to give it back in exchange for points. Under the current Marriott Travel Package program, that is possible. A 7-night Cat 1-5 certificate could be traded in today for 45K Marriott points (note: I wouldn’t do that). We don’t yet know whether or not it will be possible to do a similar trade with the new program. The true value of a 7-night certificate today lies somewhere between that value and the normal points cost of the hotel (you obviously wouldn’t consider paying more than the normal points cost). Your valuation may certainly vary some here and we will surely have more in-depth analysis as we’ve had more time to consider the charts. This is meant to be a first look at the Travel Packages. If you’re eyeing a Marriott Travel Package, the current packages undoubtedly present more value. What’s more, they may turn out to be a huge win depending on how un-redeemed certificates are treated in August (See: Potential huge win with Marriott Travel Packages before August). Of course, we don’t yet know how that will shake out. And we do know that SPG’s off-the-charts properties are going to become bookable at very attractive rates in August. Personally, I redeemed for a Travel Package the other day. Had today’s announcement not indicated that the off-the-charts properties are indeed going to be bookable for 60K per night this August, I may have considered booking a second package — though, at this point, I think I’m more likely to hold onto a balance of points to see what kind of outsized value I can get from top-tier properties in August. More analysis on the new program coming from Greg shortly…. NOW LIVE: New Marriott SPG Award Category Assignments. It seems to me, that for someone like me that is NOT going to use the 7 nights (or more than 2 nights in a row stay in the next year), that perhaps I am better off sitting pat. If I transfer my points anywhere I lose flexibility. Am I missing something? If I were you, I wouldn’t do anything. I think that if you need miles and plan to use United or a carrier which gives 120k miles for a 270k cat 1-5 package, then booking now and refunding the certificate for 45k (after waiting to see if anything good happens first) would be a better deal than holding. The 225k net cost would get you only 90k miles using a regular transfer. I currently have a Cat 9 cert in hand, and have a reservation for later this year in Paris. So we don’t know yet how a Cat. 9 cert would be usable on SPG properties at this point for later this year? Correct – we don’t yet know. Any idea when they will release the SPG changes? All of the SPG properties are in that list. The thing about the 7-night packages is that we don’t know what will happen with the certificates. Don’t get caught up on the name “Category 8”. Today’s Category 8 is not the same thing as the new chart Category 8. Right now, a Category 8 hotel goes for 40,000 Marriott points per night. In the new chart, that’s comparable to Category 5 (peak = 40K) or Category 6 (off-peak = 40K per night). We don’t yet know if they will convert your certificate to a Category 5 or Category 6 or just give you the points value of 7 nights at a current Cat 8 – so nobody knows where you’ll be able to book or whether you’ll just get points instead, but I wouldn’t expect that you can book a future Cat 8 with it as that category in the new chart requires a lot more points (unless they give you points back in exchange for your certificate, in which case you can use the points for whatever you want). I kinda wish Marriott hadn’t used numbers and had instead used something like “Category Apple, Category Orange”, etc on the new chart. Lots of people are getting confused by the fact that the charts are different and old X doesn’t equal new X. Thanks, Nick! It’d be very difficult to deal with this transition without you guys. Long story short, it’s possible that those certs will become usable anywhere. There is also a chance they get converted to points. The Marriott FAQs make it sound like they will probably get converted to certs that can be used at any hotel that charges up to 60K per night — which would be all of the Marriott / SPG / Ritz properties under the new chart through the end of this year. If they give you points, all the better. Read that post for more. The math is wrong. Whether you make extra 25k miles it depends on when you redeem your certificate. 240,000 Marriott points will give you 100k miles, so the free certificate is costing you 90k Marriott points, or 15k x6. If you redeem your certificate for standard category 3, you’re already breaking even. If you use it for category 4 off peak, you’re only saving little over 2000 points per night (or about $85 combined based on current valuation). When do the new travel packages pricing take effect? Do we have up until August 1st to book these packages at the old rates? Marriott hasn’t been clear on an exact date. They keep saying “in August”. I don’t see how this is anything other than a huge devaluation. Many people have difficulty using the full 7-night award, so the value was always in the airline miles, with the hotel rooms being the bonus. Previously, you could get 100,000 AS miles and 7-night Category 1-5 hotel for 250,000 MR points. Now, that same deal (new Category 1-4) is going to cost you 330,000 miles — almost 33% more! And it gets even worse as you go up in value on the hotel category chart. How do they justify promising us that the program was going to provide “essentially the same value” as before for all of these months. They didn’t say “essentially the same value” with regard to the Travel Packages. They said “similar value”, which we took to mean would involve some changes (and nobody expected the packages would get more valuable — it was a question of how hard they would be hit). I expect that Marriott doesn’t view the hotel certificate as the “bonus” but rather thinks of it as the heart of what they are selling you (doesn’t seem totally unreasonable that the hotel chain selling you the hotel & air package sees their part as kind of important). You’re not wrong that if you are focused on the miles and not intending to use the full 7 night award, the new packages are useless for you. The only value in the new packages is if you value the 7 night certificate somewhere near the value of the room in terms of its redemption cost. Like I said, it’s definitely a devaluation and I see where you’re coming from if you’re miles-focused (which does make some sense as the miles are clearly more valuable to us). The only similar thing about this significant devaluation is the name of the program. Yet the bloggoshere who relies of shilling credit cards and gushing about “free” travel offers nothing but lame excuses. Is there even really a need a to “do the math?” The new package chart is a massive deval from the 7 night cat 1-5 + 120k mile packages. MASSIVE MASSIVE deval. Combine that with the fact that it will be much harder to earn Marriott points (no more buying SPG points on the cheap and no more credit card gaming). I think this will kill the Hotel and Miles package game. Huge devaluation. I got my Alaska/Category 1-5 package. Thinking of doing one more before August. I feel horrible for Marriott customer service reps. The one I talked to the other day told me half the people shout and yell at the customer service reps b/c the callers think that somehow the reps have some power over the “hold” line. Marriott better be taking care of their employees. This is a detail management nightmare. boom. ’nuff said. mic drop. I’m Curious. If I were to cash in 390,000 MR points for a Cat 9 certificate today I would get 132,000 United miles and a 7 night certificate. My ultimate goal would be to get 7 nights at St. Regis Maldives after merger. If they turn certificates back into points at current rates I would get 45,000 points (current cat 9 value) times 7 so 315,000 points deposited back into my account? That would mean I scored 132,000 Unites miles for 75,000 Marriott points? Is there any way that is correct? I could then take my 315,000 MR points throw in 105,000 Chase points and book the St. Regis for 7 nights at the 60K per night rates costing a total of 420,000 points??? Then all i need is an additional 40K united (more chase points) miles to fly free and stay free for 7 days at St. Regis Maldives. That is a 35K value. Youre missing one more thing: you’d need to find 7 straight nights of standard availability at the St. Regis Maldives. We don’t yet know what that will look like, but if I were laying a wager, it wouldn’t be on how easy that will be. Don’t get me wrong — I’m excited about the chance to book these places for 60K per night (and 5th night free) — but I’m setting expectations low on how easy that will be. Though I think you have the math off on the current Cat 9 value — seven nights is really 6 x 45K since the 5th night is free on award stays — so if that huge win comes through (which is far from a known known — it’ll be huge if it happens), you’d stand to get back 270K, not 315. But yes, otherwise, that’s what makes the current packages exciting. If it works out that way on the conversion, it’ll be great. So in your expert opinion do you think the likelihood of me coming out ahead outways the negative and I should move forward with the travel package? So if Regis Bora bora after the August dates hat is still to be announced, I would need to get a category 7 certificate correct? As long as I book by December 31, 2018? What makes me nervous is I don’t know what the availability will look like for the hotel there. That’s a good question. I expect that a “new” Cat 7 cert would work at the St. Regis if you book by Dec 31st (though, again, availability may be tough). We’ll try to get a firm answer on that. Thank you for many years of valuable information about travels, points and miles. I need your advice about using Marriott points. The new 7-night package and miles exchange rate is terrible. Marriott members loose miles and have pay more points. My wife and I have half dozen 7-night packages and a few millions (that’s true, few millions points) with 30 years traveling) Marriott points. We have no immediate plan. Should we exchange for more 7-night packages and miles before new rate in August? 1. Which category you recommend? 2. Should we exchange as much packages as possible and save, say 1 million points for later use? I think it’s depend on how many miles you have. If you also have millions UA,AA,DL,AS…miles, then save MR for the stays. I personally like a balanced portfolio. Depends on where you’re flying from. If from USA, I would do Alaska definitely. 50k Alaska miles is enough for a one way biz class ticket to Asia on CX (free stopover as well). Only if you can find a seat. CX availability with AS miles is almost disappeared these days. Just called for a second travel package. The Rep was nice and expert on these. Took 5 minutes. I asked her if she had many requests for travel packages over the past days since the devaluation was announced and she said nope. Very few requests. its because theres no rush. packages arent limited and there will be no immediate deval to the current structure vs “limited time offer. limited number packages left”. meaning, you can wait until the last day which obv isnt recommended but theres plenty of time. no rush. waiting longer is better for the 7 day certs anyway. start the clock later. Wow. 15-18 months ago 270k Marriott would get you a week in a cat 1-5, 120k WN points, and a CP for almost 2 years. Now 390k gets a week, 100k WN, and no CP. For many people, that’s easily over 50% devaluation. Some from Marriott and some from WN. Time for another look at Hyatt with its new CC. The new Hyatt CC is definitely an exciting option. I’m curious to do some analysis and comparison….you’ve given me an idea…. I might be missing something, but why every blogger assumes the SPG direct transfer rate of 20K:25K (i.e. Marriott 60K:25K) will be kept? Is there any solid proof of this belief? Exactly. Not an assumption — they confirmed that back in April. For those of us who have recently purchased a travel package and would like to purchase another before the changeover, the difficulty of getting away for an additional seven nights within the one-year time limit presents a problem. Now if Marriott agreed on a two-year time limit, a second purchase would be a no-brainer. Marioot has recently said that there will be fewer standard award rooms available after 8/1. It seems a lot of people are holding on to points hoping to be some of the very lucky few who get these few aspirational redemptions, but I suspect the temporary award chart that goes into effect 8/1 is really just more of an enticement to get people not to redeem for a better mileage return on current travel packages. We’ve been warned. I thought I read somewhere that capacity control goes away after 8/1. Doesn’t that mean the amount of.standard awards available does not change? Not sure if this is new info or not, but if so, it may shed some light on how Marriott might convert open 7-night certs into points, which is one of the rumors out there. The other day I converted a Cat 7 cert to a Cat 9. My account activity showed +105,000 points for turning in my 7 and -165,000 points for getting the 9. Thanks for the data point — but no, that’s not new info. If you cash in a Cat 1-5, you get 45K points. If you cash in something higher, you get the difference between Cat 1-5 and that level if you cash in. A Cat 1-5 cert currently costs 270K. A Cat 7 cert costs 330K – 60K points more than a Cat 1-5. Adding that up, 45K + 60K = 105K value. If you cashed in a Cat 7 cert right now rather than using it, Marriott would give you 105K. When you upgrade or downgrade, you see those values (you paid an additional 60K for the Cat 9, so now your cash in value is 165K today). The reason we don’t see that as the likely way for Marriott to handle these is that the average consumer buying a 7-night certificate would be shocked if Marriott suddenly paid them out way less points than the cost of a 7-night stay. Imagine Joe BusinessTraveler who has been staying at Marriotts for years and doesn’t read miles & points blogs. He cashes in 390K Marriott points for a Cat 9 seven-night certificate (and the miles of course). Then Marriott says, “we’re cancelling your 7-night cert and giving you 165K points”. That’s only enough for 3 nights at a current Cat 9 (45K points per night x 3 = 135K…so he’d have 30K left over). Joe would be incredibly unhappy and likely not understand where that came from when he felt be bought and paid for a 7-night certificate. It’s not impossible for Marriott to handle it that way, but I think it’s very unlikely. The most likely scenario is that you’ll get a new 7-night certificate valid at properties that charge “up to X points per night”, where X is the cost of the category you originally bought (or a close approximation). That’s not easy to work out perfectly since the new chart doesn’t match exactly, so we don’t yet know how they will handle it. If you have a current Cat 9 (valid at current Cat 9 properties that charge 45K per night), it’s possible that they will give you a new Cat 6 cert (valid at properties that charge up to 50K per night) or a new Cat 5 cert (valid at properties that charge up to 35K per night). If the latter, it would seem like they may offer something to make up for the apparent “downgrade”. It’s hard to say. The less likely but intriguing scenario Greg has previously laid out is that they will cancel your cert and give you enough points for 7 nights at the category you originally booked (6 x the nightly points cost since the 5th night is free). At Cat 9, that would be 270K points. If that happens, it would be a massive win. We don’t think this is the most likely outcome, but it’s a possibility. Either way, the cash in values you see have long been the case and I don’t think they are likely what will be the value given. Hopefully, we’ll know soon. I really appreciate all your knowledge and willingness to share it with us! One area that I don’t see covered is our main focus is getting a Southwest CP for 2019-2020. Then use the 7 night certificate in Hawaii after they start flying there in 2019. If I get a 7 night certificate yielding 120K Southwest RR points before August! When do these RR points post to our SW account? We currently have the CP through the end of this year? The points post within a few days of redeeming the package (I think it was 2 or 3 days when I did it with Southwest last year). However, those points do not count towards the Companion Pass. Transfers from hotels stopped counting towards the Companion Pass in March 2017. I figured there’d be a devaluation so I ended up ordering a Cat 7, 7-night certificate + 120K Southwest miles about 4 weeks ago for travel in April ’19. Glad I did. That cost me $330k points, which at the current cash rates for booking the same hotel and flights would end up at about 1.12 cents per point. Given this new structure, the same package would cost 570k points AND I’d only get 100k SW miles instead of 120k. That’s a massive devaluation to 0.60 cents per point redemption rate vs cash values. The hotel & flight packages used to be a great value for points redemption but unfortunately now look average at best.